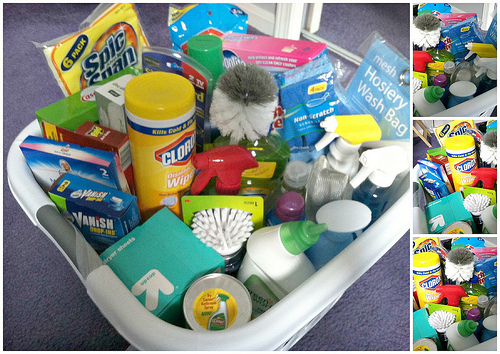 Being that we are in the midst of the gift giving season, it got me thinking about House Warming Gifts. The ones my husband and I received when we built our home in 2002 really stand out in my memory. Becoming a homeowner is such a huge accomplishment, and I remember settling in with a new frame here and a beautiful plant there..it really made our new house feel like a home. My in-laws purchased our first ever washer and dryer and gave it to us as a housewarming gift! A smile still comes to mind when I think of how excited we were over not needing to go to the laundry mat! But housewarming gifts do not need to be that extravagant or expensive. Some common ones are indoor potted plants, or perhaps a bottle of wine. But I thought a few practical ideas might give you something to consider if you have a friend or relative entering into home ownership. 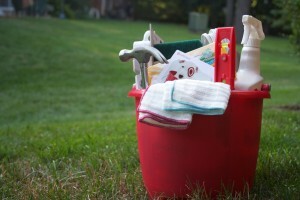 A collection of cleaning supplies in a bucket can be a very useful gift. Or, a simple toolbox with a level, hammer, some screws and anchors for hanging pictures, and the all purpose electric screwdriver. I love mine! Another idea is a Swiffer set - that company has tons of options for cleaning. I also love the idea of a rake and shovel, or even a small step ladder. The homeowners are going to need these things! The other unique idea I came across was stocking someone's fridge. Imagine after packing and unpacking boxes for days, some friends arrive with bags of groceries and staple items for the pantry. Tell me that won't be appreciated! So, we all love vases and picture frames, but maybe consider a practical alternative if you're in the housewarming spirit this season!